Shortly after adopting Killian we realized just how easy a greyhound was to have around the house. We decided to have a multi-dog home. Killian was nice and quiet, required very little maintenance; he was happy to go on a nice long walk once a day and was respectful of the cat. 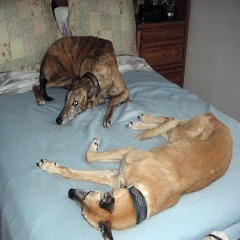 Not being a puppy there was virtually no effort to housebreak him, one of the big plusses of adopting a retired racer. I said I would love to have another greyhound to keep Killian company. Greyhounds are “pack” hounds, meaning that they enjoy living a communal life style. They have spent all of their lives with lots of other greyhounds and for the most part are very comfortable sharing a home with other greyhounds. They are ideal for a multi-dog home. Killian really enjoyed going to the Meet and Greets as well as meeting other dogs on our walks. So we felt he might like the company of another greyhound at home. Not all greyhounds appreciate sharing their “space” with other pets. Some greyhounds have a very high prey drive—they make very good racers but should never be placed in a home with other pets. Those pets become prey in their eyes and may not survive the co-habitation. Killian was a very good candidate to have a housemate so we adopted Murphy. When he arrived at the Foster home, we took Killian over to meet his new brother. It was neutral territory so they would not be distracted by any territorial issues. They became Fast Friends even though their personalities were completely different. Where Killian was very laid back, Murphy was outgoing. Murphy loved toys and Killian did not have much interest in them so there was never any problems with which toy belonged to which greyhound. I really think that Killian enjoyed having another greyhound and I am sure Murphy really loved being in a home with good food and a nice soft bed to sleep on. Most rescued dogs are so grateful for being rescued from a not so nice situation they usually fit in and make the best of a good situation. When McSorley came to join the pack we realized that each and every greyhound has a personality of their own. Killian was the suave debonair one who would grace people with the privilege to pet him. He knew he was handsome. Murphy and Killian welcomed McSorley to their multi-dog home. Murphy was the consummate athlete. Every day he would go out in the yard and run laps around the yard. He would grab a toy, give it a shake, make sure I was watching and take off like lightning. Very often he would try and get Killian to run with him, sometimes he was successful and it was a beautiful sight to watch. They say that greyhounds are like potato chips, “Bet you can’t have just one” so we added McSorley. He was the Class Clown of the trio. He would prance around and chatter like an old wash woman. When Murphy would start doing his laps Macky would convince Killian that they should stand on the deck and watch Murphy run. He was firmly convinced that once you retire you DON’T go back to work. Having more than one dog in the home will be more expensive,more food, more toys, more beds and leashes. Walking multiple dogs is almost an art form in itself. With the addition of McSorley I found that having two dogs on a splitter was very helpful in keeping order to the pack. I put harnesses on the dogs and joined McSorley and Murphy together on my left and Killian on my right. This kept everyone in line and no one tripped me. They knew who was “in charge” and obeyed the rules; life was good with our Beer Boys. Of course, the visits to the Vet became more expensive also; lucky for us our Vet offered a discount on his fees for a family with multiple pets. Having a good Pet Insurance policy is a very sound advice if you have a multi-dog home. If you feel the additional expense, and extra poop to scoop, is something that fits your life style then I highly recommend having more than one rescued greyhound. There are so many greyhounds that need a good home and some love the rewards outweigh the work and expense involved in multiple-pets. Traveling with multiple greyhounds is not as difficult as most people think. I have a PT Cruiser and all three of my Boys traveled very comfortably in it. We took many trips with our Boys and every time we went it was exciting for us all. There are many places which are “pet friendly” and the Boys always had a good time. It was nice to have them with us and not worry about leaving them behind. Currently we have two females that we refer to as The Beer Girls, Harps Lager and St. Paulie Girl. All I have to do is say “road trip” and they are at the door waiting to jump in the PT Cruiser and off we go. At one time we shared our home with four greyhounds and two cats, all rescued, all appreciative of the love and attention that they received and all getting along. For us, the benefit of saving the life of an innocent creature far outweighed the extra work and expense of a multiple pet household. As dog rescue becomes increasingly popular, a multi-dog home may soon be the norm. Become a chipper.